Listed below you can see many of the features available with Sapman v12 – you decide which you wish to use. If you have requirements that are not on the list, ask us – the list is not comprehensive and Sapman v12 is in constant development. Fully hybrid manufacturing capabilities: batch manufacturing, make-to-order, make-to stock, Kanban and service works orders. End-to-end batch and serial number traceability for materials, sub-assemblies and finished goods. Used by medical products and aerospace manufacturing customers. Sophisticated rule based cost estimating system with unlimited quantity breaks affecting both material and operation costs. Advanced product configurator integrated with Bills of Materials. Bills of Materials (BOMs) with unlimited levels, parts, manufacturing operations, sub-contract operations and resources. Multi-version BOMs to control amendment history, international variations, R&D changes and customer specific requirements. Trial kitting with recursive drill down through multi-level Bills of Materials including phantom BOMs. How many can I build? function. 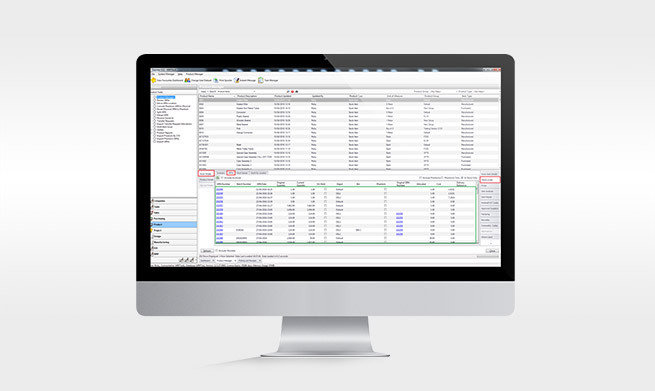 Advanced traceability enquiry and reporting facilities. Works order route progressing with time-sheet data entry for labour, materials and finished goods processing. Works Order Processing with multi-depot manufacturing control and automatic works orders from MRP and MPS. Works order costing with actual to estimate comparison facilities. Detailed workshop documentation including works orders, route cards, operation cards, job cards, kitting/picking lists, CAD drawings, labels, and quality assurance certificates. Bill of Materials tree-view with collapsible/expandable nodes. Barcode label printing and full support for industrial label printers such as Zebra. Scrap allowances including backflushing of historical scrap usages. Copy BOM and BOM template facilities. Backflushing of bulk issue items and of standard resource utilization times. CAD/CAM drawing viewer compatible with all major CAD/CAM drawing types. Component substitution linked to alternative parts defined within the Bill of Materials (BOM). Alternative routing of works orders including adding or removing operations and re-allocating resources. Advanced task manager with threaded responses and stakeholder notification via email. Integrated with MS Word, Excel and Outlook. Document management system allows any document that can be loaded on a Microsoft client to be attached and viewed. Unlimited user-defined analysis codes in all modules. Microsoft SQL Database allows authorised users complete access to data and database schemas – use all report designers (MS Excel, Access, Crystal…). Quick sales order processing with auto picking and rapid document workflow. Advanced price list pricing systems on Sales Orders, Purchase Orders and Quotations. Advanced delivery documentation including QA certificates, certificates of conformity and export control. Inter depot transfers including goods in transit management. Perpetual stock take system with A B C Codes and Shop Floor Data Capture via wireless Barcode scanners. "Sapman V12 has been carefully designed to be powerful, flexible and yet easy to use. As a user of the original Sapphire V10 product since 2004 we are very pleased to be staying with SMS Limited and adopting their Sapman V12 product on Microsoft SQL Server."